Ted Andrews, CEO of HerbCo International, says the H-2A agricultural guest worker program needs improvements. 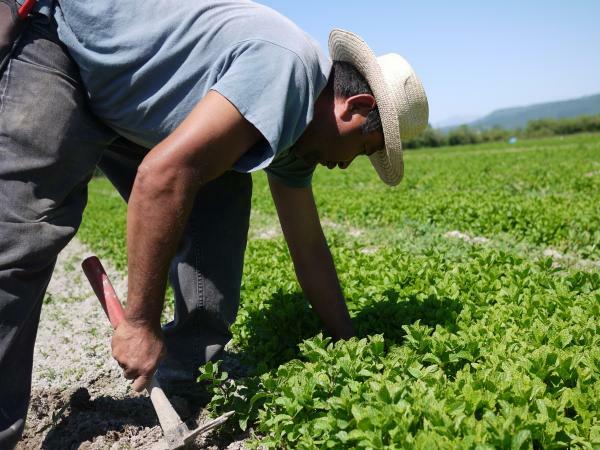 Celerino Sanchez, an H-2A worker from Guerrero, Mexico, weeds rows of mint at HerbCo International in Duvall, Wash. The ongoing immigration debate in Congress often spotlights the job market for people living in the U.S. illegally. Not long ago, that market included one of the country's top organic herb farms — until an immigration bust forced the business, based in Washington state, to clean up its payroll. Ted Andrews, owner of HerbCo International, says he's learned some tough lessons during the transition to a legal workforce. Lesson No. 1: "There are events that can destroy a business in the snap of a finger," he says. "This was one of them." In 2011, Andrews pleaded guilty in federal court to knowingly hiring illegal workers from Mexico. That came after an immigration inspection revealed that Andrews had employed more than 200 people without valid paperwork at his farm near Seattle. HerbCo International grows a variety of herbs on farms in five states. After the "immigration event," as Andrews calls it, he struggled to find a stable and legal workforce at this farm. Hundreds of workers came and went, but few lasted long. So Andrews turned to the federal H-2A visa program to bring in more workers straight from Mexico. They're paid about $12 an hour, the same wages as the local crews. But the company also covers the guest workers' travel costs, housing and other fees. Altogether, Andrews ends up paying about $1.50 more per hour for each foreign worker. But there is a big upside, Andrews says. "They certainly are our very best employees. They come here willing and able to do the job. They're happy to come here and work and work and work." That's not necessarily a good thing, says Andrea Schmitt, an attorney with Columbia Legal Services in Olympia, Wash., who focuses on farmworker rights. "That's often described by growers as H-2A workers being 'good workers,' in quotes," she says. "Sort of a euphemism for people who follow orders, no matter what." While the H-2A program includes protections for workers, Schmitt says, these contract employees are still vulnerable to abuses because "they're really far from home, they've been brought here by somebody else and are generally less aware of their rights." The use of the H-2A visa program has steadily grown in recent years due in part to stepped-up immigration enforcement. Since 2009, the feds have more aggressively audited employers to ensure their workforces are legal. It's this audit process that led to HerbCo's criminal prosecution, massive staff turnover — and a $1 million fine. "At the end, we want to reduce the magnet for illegal immigration, and that is employers," says Waldemar Rodriguez, a deputy assistant director with U.S. Immigration and Customs Enforcement's Homeland Security Investigations. Rodriguez says the agency's recent shift to targeting employers more than workers is paying off. Last year, the agency set a record for these immigration audits and subsequent criminal arrests. Back at the HerbCo farm, Augustina Reyes waters row after row of basil plants inside an 85-degree greenhouse. Reyes, who came here on the H-2A program from Oaxaca, Mexico, says the visa program is perfect for her. She used to sneak across the border for work, she says, but prefers the less-risky trip as a guest worker. "It's better to come with the program because I don't have any trouble coming here," she explains. Reyes is on a seven-month contract and expects to save up $4,000 to $5,000 to take home, after deducting her stateside expenses, such as cell phone bills and groceries. Farm owner Ted Andrews hopes to see improvements in the guest worker program included in the immigration reform bill passed by the Senate and now stalled in the House. Most H-2A visas last 10 months or fewer, but Andrews would prefer to employ guest workers for an entire year. He's also had to hire extra staff to navigate the complex program and complete the required paperwork, he says, and has had guest workers arrive several weeks late. That's disruptive for growers who rely on a large labor force during a short harvest window, he says. Despite these challenges, Andrews says, the biggest lesson from his immigration event makes the program well worth the effort: "It's about the people. The people make the harvest." If you take care of your employees, he says, they'll take care of you. Copyright 2014 Puget Sound Public Radio. To see more, visit http://www.kuow.org. The immigration debate in Congress focuses on migrants seeking work in the U.S. illegally. But in recent years, the crackdown has focused as much on their employers as on the employees. 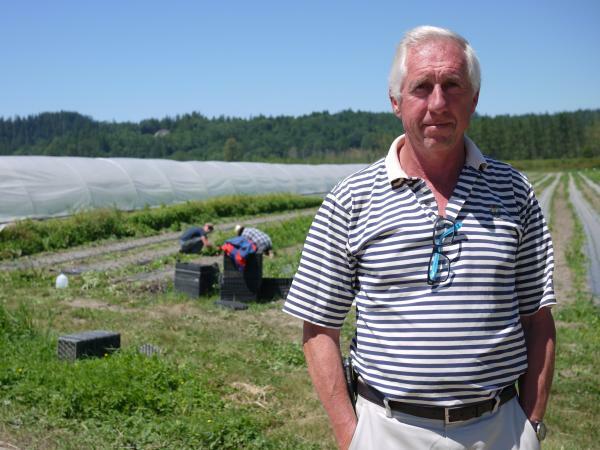 Among the many businesses caught in that crackdown was a top organic herb farm based in Washington State. As a result, its owner turned to a federal program that now allows him to import foreign workers legally. Liz Jones, of member station KUOW, has that story. LIZ JONES, BYLINE: Here's lesson number one for farm owner, Ted Andrews. TED ANDREWS: That there are events that can destroy a business in the snap of a finger, this was one of them. JONES: Two years ago, Andrews pled guilty in federal court for knowingly hiring illegal workers from Mexico. That came after an immigration inspection revealed Andrews had employed more than 200 people, without valid paperwork at his farm, near Seattle. ANDREWS: It was against the law and I paid the price for it. JONES: So what are you growing in these fields here? ANDREWS: This is mint right here, rosemary over there. He's in the sage with the rototiller. JONES: Andrews' company, Herb Co. International, includes farms in five states and a home base here in Washington. After the immigration event, as Andrews calls it, he struggled to find a stable and legal workforce at this farm. Hundreds of workers came and went but few lasted long. So, Andrews turned to the federal H2-A visa program to bring in more workers straight from Mexico. They're paid the same wages as the local crews, about 12 bucks an hour. But Herb Co. also covers the guest workers travel costs, housing and other fees. Altogether, Andrews ends up paying about $1.50 more per hour for each foreign worker. But there is a big upside. ANDREWS: They certainly are our very best employees. They come willing and able to do the job. They're happy to work and work and work. ANDREA SCHMITT: That's often described by growers as H-2A workers being "good workers," in quotes; sort of a euphemism for people who follow orders no matter what. JONES: Andrea Schmitt is an attorney in Olympia, Washington, who focuses on farm worker rights. While the H-2A program includes protections for workers, Schmitt says these contract employees are still vulnerable to abuses. SCHMITT: And that's because they're really far from home. They've been brought here by somebody else and are generally less aware of their rights. JONES: The use of the H2-A visa program has steadily grown in recent years. That's partly due to stepped up immigration enforcement. Since 2009, the feds have more aggressively audited employers to ensure their workforce is legal. It's this audit process that led to Herb Co.'s criminal prosecution, massive staff turnover, and a million dollar fine. Waldemar Rodriguez is a deputy assistant director with ICE Homeland Security Investigations. WALDEMAR RODRIQUEZ: At the end, we want to reduce the magnet for illegal immigration - and that is employers. JONES: Rodriguez says the agency's recent shift to target employers more than workers is paying off. Last year, the agency set a record for these immigration audits and subsequent criminal arrests. JONES: Back at the Herb Co. farm, Augustine Reyes waters row after row of basil plants inside an 85-degree greenhouse. JONES: Reyes came here from Oaxaca, Mexico on the H-2A program and says it's perfect for her. JONES: She says she used to sneak across the border for work. But she prefers the less risky trip as a guest worker. Reyes is on a seven-month contract. She expects to save up four to $5,000 to take home, after her stateside expenses. Farm owner Ted Andrews hopes to see improvements in the guest worker program, as part of the immigration reform bill passed by the U.S. Senate, and now stalled in the House. And that gets to the biggest lesson from his immigration event. ANDREWS: It's about the people. The people make the harvest. JONES: And Andrews says, if you take care of your employees, they'll take care of you. For NPR News, I'm Liz Jones in Seattle. Transcript provided by NPR, Copyright NPR.